Q: Are your Murals repeated? A: All of our murals are commissioned pieces. No two are alike. If you like one of the murals you see on our web page, we can do one like it, but it won't be exact. We often use personalized objects in our pieces like wine labels with the family name, cook books with favorite recipes (Shawna's Secret Sauce)..etc. Family pets are used a lot. One of our clients collects antique cars, he has more than 100 cars, so it was hard to pick which ones to use. (That's him on the tractor and the barn is real, too) We had one client ask us to "hide" secret messages to his wife, which he surprised her with after the mural was installed. 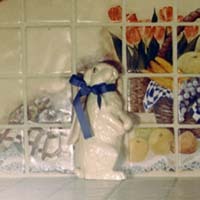 On theBunny Mural, the wine bottle has a cap that was a wedding gift to the owners, so it was included on the bottle; the lace was taken from some antique lace they owned, the homeowners name appears on the bottle, the owner makes "killer" blueberry muffins, so those just HAD to be in the mural. Also, the bunny is a ceramic bunny sliced through, (notice it's missing a left foot) and mounted into the mural with fishing line whiskers and a real ribbon tied around it's neck. 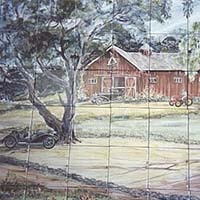 Q: Can a Mural be painted on tile that has already been installed? A: No, we paint with colored glaze. Glaze does not bond to any product until t has gone through a firing process in a kiln. We heat the tiles to approximately 1800 degrees, which is too hot for most homes. Q: Do you only do Murals? A: If you want a single deco tile, we can do that also. We can also highlight relief tiles that are made by others, . Q: Is there any tile that can not be painted on? A: Most all tiles can be painted on. We had a few problems with pink glazed tiles. Red is an unstable color, and presents some problems with achieving the exact tone we are looking for from time to time, and we experienced a slight fading of the under glaze one one job. Also, soft, or inexpensive tiles could be more prone to cracking or breaking under the stress of being re-fired, so we recommend using higher quality tile as a base. That depends on how difficult or complex the design is. The range can be from a few hundred to several thousand dollars. The typical backsplash mural is 24"x36" and costs around $1600 plus the cost of the tile. Q: What s the process to have a mural painted if I am not in the Bay Area? You can chose from the selections that we carry, or, if you find a tile in your area, let us know which product it is. It is important that we know what your choice is BEFORE you purchase, so we can determine if it is suitable for painting. You want to have enough tile to complete the entire project, with a few tiles left over. Your contractor can usually help you out on estimating quantities. 3. Decide what the scope of the project will be. Some customers simply want a few individual painted tiles place strategically in spots. Some murals highlight an area over a sink, or stove or an entryway. This is a good time to provide copies of elevation blueprints, photos, etc, to get an overall feel for the room. 4. Try to decide what you want as a "Theme"
You can browse our studio pages for work we have done for other clients, or clip idea pages from magazines, take photos, etc. Several years ago, some clients were taking a drive on vacation in England. They were so entranced with the countryside, they stopped and took some photos. When they got home, they asked if we could reproduce the photos on tiles they wanted to install in their family room. We called the tiles "memory chips". The best way, of course, is to spend some time with Cynthia Campanile, our Senior Designer. Working directly with the artist helps tremendously in making decisions, because she often begins sketching while discussing the project, developing the theme as you go. Once the theme has been decided, and the sketch is approved, we need to have the material delivered to our studio where our artist will begin the actual work. Once work begins, the typical mural is finished, and ready for firing in about 2 to 3 days. The firing process takes 2 days, so turn around time is usually about a week for a small mural.